I have noticed that undergraduate syllabi continue to list laboratory experiences under ‘practicals’ with an implicit goal of introducing students to methods and techniques that have helped us understand core concepts of a certain area of knowledge or field. An example is the “Proposed Scheme for Choice-based Credit System in B.Sc. Microbiology” (first year) from the Telangana State Council of Higher Education, Government of Telangana. Brownell et al discuss traditionally structured labs like these, termed as ‘cookbook’ labs because they provide students with step-by-step instructions on how to carry out an investigation. Published studies from the American system show that cookbook labs engage students intellectually at a lower level. The significance of experimental results is lost on students when they follow recipe-like activities. Moreover, students are exposed to poor and inaccurate representations of research when they perform cookbook labs. Some might argue that cookbook labs have their place in an undergraduate curriculum. Integrating the labs and lecture-discussions can create a cohesive learning experience for students throughout the semester/academic year. If a deliberate and diligent attempt to integrate lecture-discussion sessions with laboratory work is done, students may be broadly engaged with learning the objectives or experiments listed above. However, are these techniques and procedures, as taught by the instructors and experienced by the students, relevant to current needs? Designing an effective and engaging learning experience will depend on what the desired outcome is. The students should be aware of the clarity of the outcome; without an explicit understanding about where they are headed, students might not always be engaged in the process, and they might not find it relevant to take part in the journey. Making labs relevant and engaging to students are the two key aspects of making them effective tools for deeper learning. 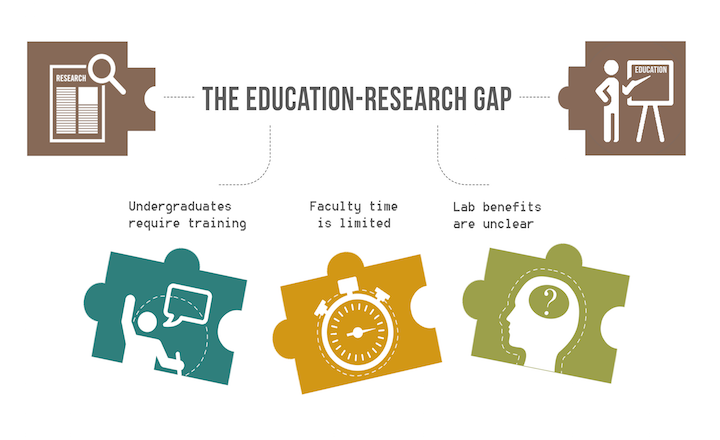 In this direction, course-based undergraduate research experiences (CUREs) are gaining prominence and popularity. There is a good amount of literature that describes the value of CUREs, feasibility of transforming traditional labs into CUREs, and the impact of CUREs on various aspects of student experience. SWI as a structured program was formulated and founded at Yale University and piloted in 2012. The focus of this program is to address a worldwide health threat – the diminishing supply of effective antibiotics in the wake of increasing antibiotic resistance. SWI claims that since their inception, the program has grown rapidly to include more than 170 participating schools across 35 US states, Puerto Rico, and 12 countries. Incidentally, India is one of those countries; the program is being implemented at the Jawaharlal Nehru Technological University (JNTU) in Hyderabad. In addition to expanding SWI on a global scale, it is also developing the infrastructure to allow SWI’s antibiotic discovery to move forward into R&D programs. As part of its expansion, SWI’s introductory biology course is being taken to the high school setting to increase its impact and act as a feeder into college programs. An effort like SWI not only benefits students in their academic pursuit but also adds great community (health) relevance in the age of multi-drug resistant microbes. Other ideas can exploit cutting edge technologies like genome engineering that not only are exciting from a scientific perspective but can have important social, ethical and legal implications. My own personal experience offering a CURE using the CRISPR-Cas9 technology to first year students at the University of Alabama at Birmingham has been exciting and intellectually stimulating. Student feedback tells me that they too enjoyed the experience. Though they don’t remember every detail of the experience, I have evidence from my CURE that there is a positive impact on academic performance of students. The idea underlying SWI and other such CUREs is by no means exclusive to the United States. Many teachers in other parts of the world, including India, would have attempted similar ideas. But the lack of widespread and consistent use of CUREs, especially in Indian undergraduate institutions, makes it appear that these efforts have not been sustainable. It would be prudent to understand the reasons for lack of sustainability of such ideas and efforts. If there are indeed programs that have been ongoing in a sustained manner, it is important that they are made widely known and they should motivate other similar efforts across the nation. If we do not act now and create/promote engaging and authentic learning experiences for students, we are doing ourselves a great disservice.